Riverine Woods Resort was earlier known as Van Ghat River Lodge. 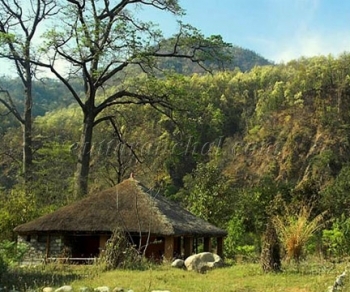 It is situated on the bank of the Ramganga River near the Corbett Tiger Reserve. It was established in the year 2003. Riverine Woods is a unique resort as it is totally aware of its natural surroundings and responsibilities. The resort has provided employment opportunities for a number of local people. The resort comprises of five cottages made of locally sourced materials. The resort also provides comprehensive outdoor orientated experience for visitors. Far from any human habitation, it is indeed the wildest resort of Corbett National Park. Riverine Woods is a mahseer conservation lodge and an exquisite eco-friendly resort that offers guests a genuine wilderness experience. The lodge offers awe-inspiring opportunities to wild-lifers, birders, anglers, as well as those just looking for a relaxing time amidst natures beauty. Riverine Woods is located in Corbett Tiger Reserve, 2.5 km inside the jungle area of the park, which is accessed by criss-crossing Ramganga in a 4X4. It is 35 km from Tiger Camp. The Riverine Woods resort is the achievement of handiwork construction. The resort is constructed by traditional builders with focus on vital natural elements like sunlight, wind and rainfall. The rooms are stays cool in summers and warm in winters - a hallmark of traditional, ancient homes in this region. The mud cottages are thatched with savanna grass over a bamboo ceiling. There are total five rooms, each designed with modern interiors to ensure utmost comfort. The cottage has a spacious bedroom and attached toilet. The Dining Hall is located at a vantage point with thatched roof which helps in regulating the temperatures. You can enjoy splendors of nature while enjoying a wholesome meal in the restaurant of Riverine Woods Resort. The dining hall also houses a well stocked library with books on wildlife. A wide variety of Indian and some continental dishes are served here. 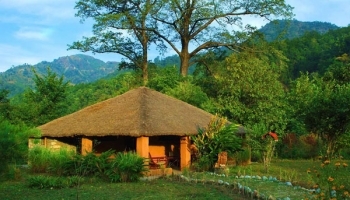 Riverine Woods offers a range of facilities and services to its guests, including: catch and release mahseer angling, jungle safaris, experienced and trained naturalists, trained hospitality staff, elephant rides (subject to availability), guided nature walks, bird-watching, a library, guide service etc. Riverine Woods arranges transfers to and from Tiger Camp, Ramnagar in a 4 wheel-drive jeep for its guests. While the camp is open round the year, fishing is closed from 15th June to 30th September each year. The nearest international airport is New Delhi situated 300kms away and Jolly Grant Airport is situated 250kms away in Dehradun district. The nearest railhead is Ramnagar located at a distance of 40kms. Pick-Ups and transfers with skilled drivers in 4x4 Suzuki or Maruti jeeps is provided to guests from the railway stations or from our resort Tiger camp to Riverine Woods.